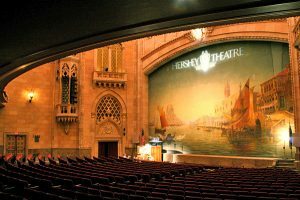 The magnificent Hershey Theatre was conceived by entrepreneur and philanthropist Milton S. Hershey in the early twentieth century. Lancaster architect C. Emlen Urban drew the plans for the Community Center Building in 1915; however, it was built between 1929 and 1933 as part of Mr. Hershey’s “Great Building Campaign” of the Great Depression, which also produced such Hershey landmarks as the Hotel Hershey, the Hersheypark Arena, and the Hershey Stadium. Dedicated in September, 1933 during the town’s (Hershey, Pa.) 30th anniversary celebration, the $3 million dollar Community Center – and its star occupant, the Hershey Theatre – soon became center stage to the world’s leading performers and shows. From its inception, the theatre was designed to be a beautiful place for Central Pennsylvanians to gather and enjoy a wide assortment of entertainment. The beauty of the architecture and the workmanship is evident from the moment the doors open into the Hershey Theatre’s Grand Lobby. From floor to ceiling, the tile area is breath-taking. The floor is laid with polished Italian lava rock. Four different types of marble, both imported and domestic, shape the walls and exquisite series of arches. The ceiling is filled with bas-relief images of sheaves of wheat, beehives, swans, pastoral scenes, Apollo and Assyrian war chariots, attractmg patrons’ eyes to the beautiful art above. The above text taken was taken from the Hershey Theatre Web Site. Please visit their site for more interesting facts about the theatre and schedule of shows.